An innovative tool for music educators, Careers Through Music highlights valuable skills developed in ensemble and music classes, and provides a pathway to achieving success in any career---both in and outside of music. Each of the book's 15 eight-minute lesson plans has the same simple format and focuses on a specific transferable skill, such as problem solving, networking, and self-management. For even greater impact, reproducible pages for student activity sheets are included, along with access to exclusive videos of music and business professionals discussing the lesson topics. 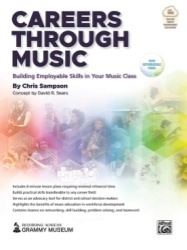 Presented by the GRAMMY® Museum Foundation and Alfred Music, this book will prepare music students for a lifelong path to success in whatever field they choose.